Why does this activity have to be restricted to one specific space, when the square meters of the house offer other possibilities? 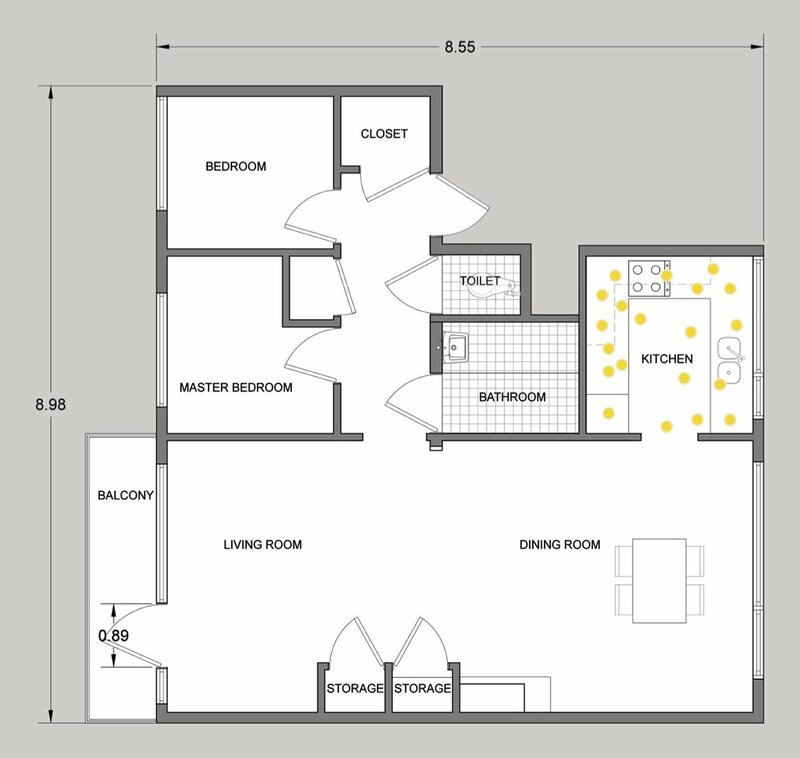 Layout of a domestic space where the kitchen is a concentrated space. Within this space, cooking can be divided into a series of different activities that require different elements, surfaces and areas.What if these could be re-distributed in the other rooms of the house? The juxtaposition of conditions that this possibility offers could create alternative lifestyles adaptable to the preference of its inhabitants and even present the possibility to not be limited to the private domestic sphere. How to design for a never ending evolution of trends and lifestyles? Since kitchen stories present so many paradoxical and different scenarios, I decided to use my experience in my kitchen as a case study to present the lifestyle some students and young professionals are presently facing. To be able to have more accurate data, I installed a Kinect scanner and a VVVV program to study the time and activities done in my kitchen during four days. Historically, time and motion studies were part of a long tradition of using empirical data to make places and people more efficient. Just as Beecher and Frederick did. However, they were intended to make cooking more efficient for the housewife. 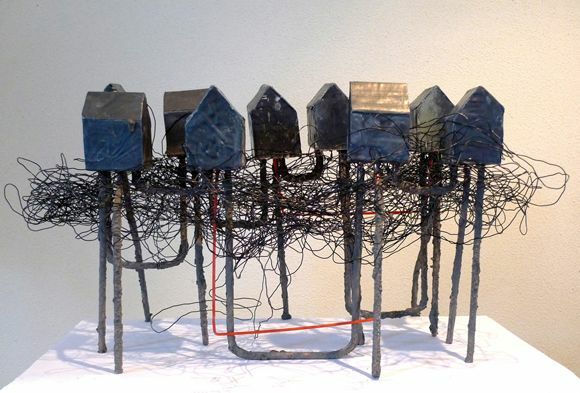 With my studies, I did not intend to “liberate” myself from the house chore that cooking implies, but to understand how the space is being used to offer a different experience within the different areas of my domestic space. I like to think of myself as a modern Bülow-Hübe, who in 1969, with motion studies did a rigorous, passionate and careful understanding of women’s movements in the kitchens of Montreal. Like myself, she described herself as a researcher-designer, but not a cook. She points out how not being the typical cook, actually gave her critical distance with respect to kitchen design. 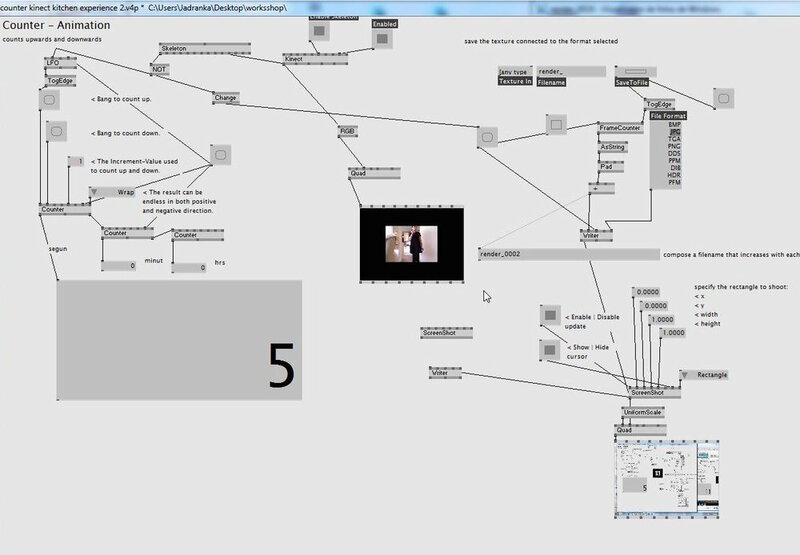 Zoom-in of the code created in order to record the different activities that took place in the kitchen space. The VVVV proved to be an accurate system for monitoring the performance of daily life activities inside the kitchen. The data obtained allowed a deeper analysis of how the space is used in terms of time. From 17/02/2017 to 20/02/2017 my roommate and I made use of the space for 1:17 minutes. This is approximately 2.33 hours per week which contrasts highly with the 63 hours that were taking place when the standards of kitchen design were stablished. 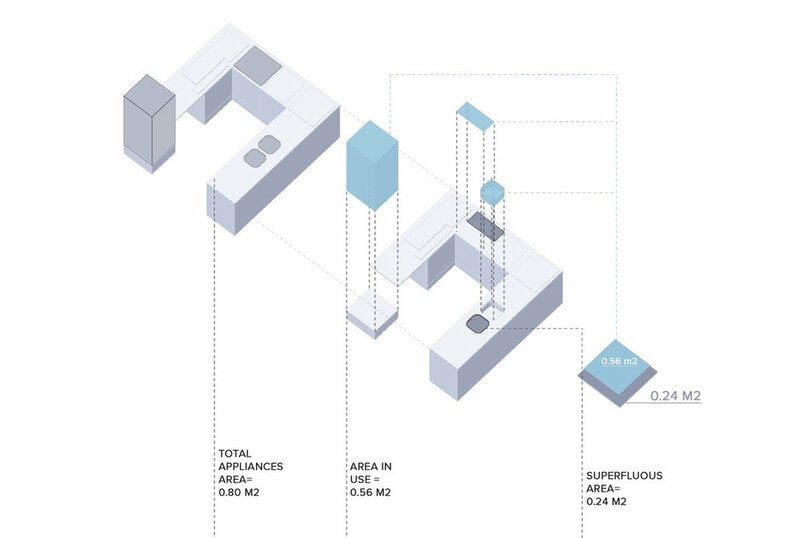 The result of the data not only creates new parameters for a more accurate design, but also makes us reflect on how many unused square meters the kitchen is enclosing. 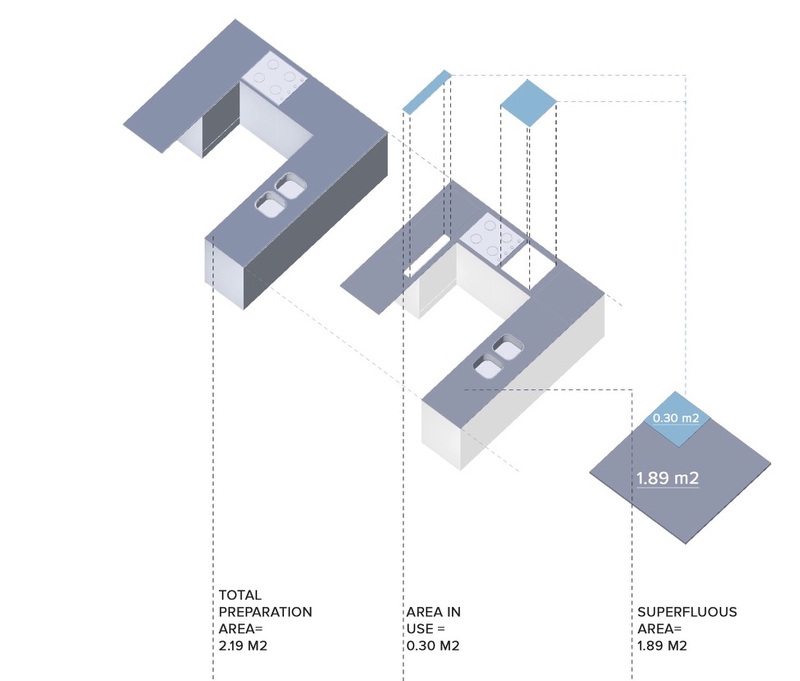 The sum of all the used space (2.85 m2) only represents the 65.97% of the total of the kitchen surfaces. 34.03% which corresponds to 4.32 m2, is space that actually is not being used. With this data, a new model occupying less surface space can be proposed. One that is not fitted in the space, but that allows to be used in different sites. Not with the primarily intention to gain more space, but to gain more possibilities of experiences within the domestic space. It would not only satisfy real necessities, but also allow more flexibility in how cooking is known and perceived. Advances in technology now offer possibilities to make a transition to the static to a more flexible and movable architecture. One that allows the liberation of the kitchen from the ground and walls.